A Fresno firefighter was seriously injured in the line of duty on Sunday. FRESNO, Calif. -- A California firefighter was seriously injured in the line of duty. 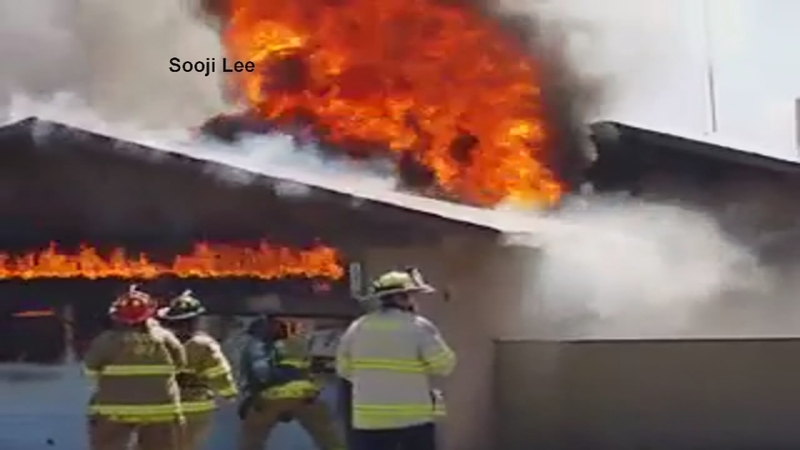 The firefighter was battling a blaze at a home near Cortland and Del Mar avenues in Central Fresno around 1:30 p.m. Sunday when he fell through the roof. Initially, officials said the firefighter was burned and suffered non-life threatening injuries. 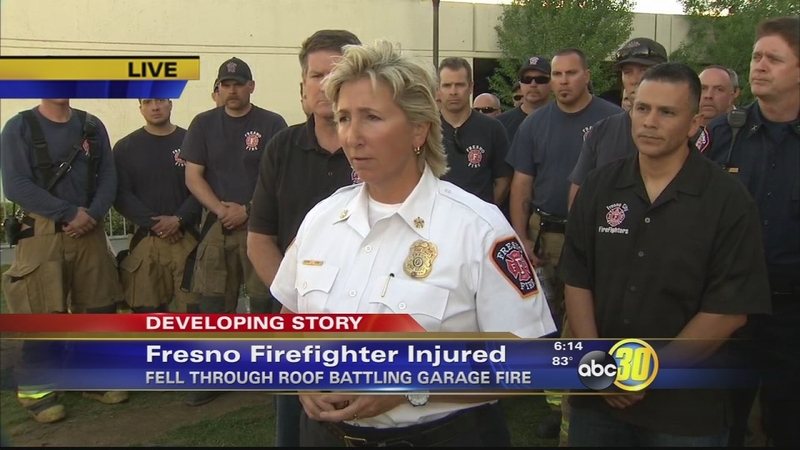 Fresno Fire Chief Kerri Donis held a news conference Saturday evening and announced the firefighter was last listed in critical condition. One step and a firefighter is swallowed by a roaring fire. How this man survived a fall through a roof into flames, one witness says, is unexplainable. "As I made a U-turn into the street, I saw a couple of firefighters on top of the roof. As one fell right in, I immediately put it into park. My daughter was screaming," said Joe Reyes. Firefighters rushed to tear down the garage door. Reyes says the team had the injured firefighter out in minutes. "Once they extracted the firefighter out of the garage, they doused him with water. And as they took his uniform off, he was burned from head to toe," said Reyes. The unnamed firefighter, who is a captain with FFD, was rushed to Community Regional Medical Center. Donis said he has third-degree burns over 30 percent of his body and 60-70 percent of his body is burned. He was climbing the roof to ventilate the house, which is a standard procedure when fighting a house fire. "Firefighting is an inherently dangerous operation. We routinely step out, and we put ourselves in harm's way," said Battalion Chief Todd Tuggle of the Fresno Fire Department. None of the people inside were hurt except for one man trying to save them. Now, his team is by his side as he starts his recovery. Investigators say this fire isn't considered suspicious at this time, but they have two investigations underway: one to figure out how the fire started and another how the firefighter fell through the roof and if there's anything they could have done to make sure that didn't happen. Per the request of the Fresno Fire Department, this video has been posted to show the dangers of firefighting.